After creating a Merchant Profile, it only has one user in it. This user can add more users: delivery guys, accountants, technical specialists, and other employees of your company. Every user needs to have a personal account on Yandex. Those who do not have ones, need to create them under Yandex.Passport. You can add new users or view the existing ones under Account Management section. Users can access different sections of the Merchant Profile. Depending on four functions: owner, administrator, operator, and developer. Owner—an account on Yandex created together with Merchant Profile. Owner adds administrators, operators, and developers, and shares access to stores and payouts with them. Only users registered on Yandex can access a Merchant Profile. This may be up to 10 users for one Merchant Profile. Go to Settings and find Users section. Push the plus icon to the right from the heading: you will see a form for adding a user. 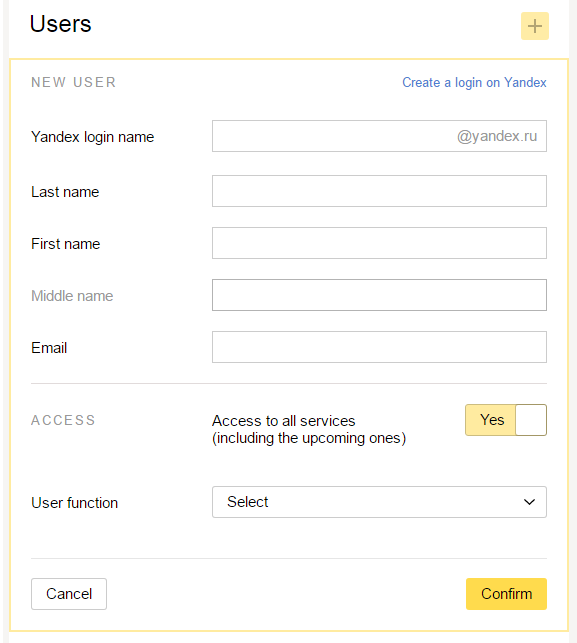 Yandex login name—any existing login. If you do not have one, you can create it under Yandex.Passport. If this login is already added for a Merchant Profile, it won't work. This is our security requirement. Full name and email address—required for communicating with our managers and sending notifications. Rights—select the user role (Administrator or Operator). The user role determines which sections certain user will have access to. Access to all services—select Yes if you want the user to manage all stores and payouts of your Merchant Profile. Including the ones to be added in the future. If you want to grant access only to certain stores and payouts, select No and check what you want in the list that will appear below. When everything is filled out, click Confirm. You will get a confirmation password to the phone number you linked with your Merchant Profile. Enter it in the field Text message password and push Save. That's it. New user will appear in the list. Find the user you need in the list and push the pencil icon (with the Edit prompt) to the right from the user's login name. You will see a form with information about the user. You can change the user's name, phone number, email address, and access permissions. When everything you want is changed, click Confirm. That's it. Access and user details are changed. Find the user you need in the list and push Stop sharing to the right from the user's login name. You will get a confirmation password to the phone number you linked with your Merchant Profile. Enter it into Text message password field and push Confirm. That's it. The user will no longer be able to access your Merchant Profile. Accesses to other Yandex services won't be affected. If you decide to share the access with this user again, you can do it, but you will need to provide all information anew.